Did the witch of Endor have power to call up the prophet Samuel from the dead? The belief in communion with the dead is still held, even in professedly Christian lands. Under the name of spiritualism the practice of communicating with beings claiming to be the spirits of the departed has become widespread. It is calculated to take hold of the sympathies of those who have laid their loved ones in the grave. 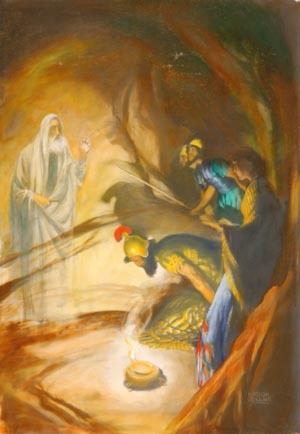 Spiritual beings sometimes appear to persons in the form of their deceased friends, and relate incidents connected with their lives and perform acts which they performed while living. In this way they lead men to believe that their dead friends are angels, hovering over them and communicating with [p. 685] them. Those who thus assume to be the spirits of the departed are regarded with a certain idolatry, and with many their word has greater weight than the word of God. Modern spiritualism and the forms of ancient witchcraft and idol worship—all having communion with the dead as their vital principle—are founded upon that first lie by which Satan beguiled Eve in Eden: "Ye shall not surely die: for God doth know that in the day ye eat thereof, . . . ye shall be as gods." Genesis 3:4, 5. Alike based upon falsehood and perpetuating the same, they are alike from the father of lies. The "familiar spirits" were not the spirits of the dead, but evil angels, the messengers of Satan. Ancient idolatry, which, as we have seen, comprises both worship of the dead and pretended communion with them, is declared by the Bible to have been demon worship. The apostle Paul, in warning his brethren against participating, in any manner, in the idolatry of their heathen neighbors, says, "The things which the Gentiles sacrifice, they sacrifice to devils, and not to God, and I would not that ye [p. 686] should have fellowship with devils." 1 Corinthians 10:20. The psalmist, speaking of Israel, says that "they sacrificed their sons and their daughters unto devils," and in the next verse he explains that they sacrificed them "unto the idols of Canaan." Psalm 106:37, 38. In their supposed worship of dead men they were in reality worshiping demons. By the prediction of Saul's doom, given through the woman of Endor, Satan planned to ensnare the people of Israel. He hoped that they would be inspired with confidence in the sorceress, and would be led to consult her. Thus they would turn from God as their counselor and would place themselves under the guidance of Satan. The lure by which spiritualism attracts the multitudes is its pretended power to draw aside the veil from the future and reveal to men what God has hidden. God has in His [p. 687] word opened before us the great events of the future—all that it is essential for us to know—and He has given us a safe guide for our feet amid all its perils; but it is Satan's purpose to destroy men's confidence in God, to make them dissatisfied with their condition in life, and to lead them to seek a knowledge of what God has wisely veiled from them, and to despise what He has revealed in His Holy Word. Shall those who have a holy God, infinite in wisdom and [p. 688] power, go unto wizards, whose knowledge comes from intimacy with the enemy of our Lord? God Himself is the light of His people; He bids them fix their eyes by faith upon the glories that are veiled from human sight. The Sun of Righteousness sends its bright beams into their hearts; they have light from the throne of heaven, and they have no desire to turn away from the source of light to the messengers of Satan. The demon's message to Saul, although it was a denunciation of sin and a prophecy of retribution, was not meant to reform him, but to goad him to despair and ruin. Oftener, however, it serves the tempter's purpose best to lure men to destruction by flattery. The teaching of the demon gods in ancient times fostered the vilest license. The divine precepts condemning sin and enforcing righteousness were set aside; truth was light regarded, and impurity was not only permitted but enjoined. Spiritualism declares that there is no death, no sin, no judgment, no retribution; that "men are unfallen demigods;" that desire is the highest law; and that man is accountable only to himself. The barriers that God has erected to guard truth, purity, and reverence are broken down, and many are thus emboldened in sin. Does not such teaching suggest an origin similar to that of demon worship? Satan was determined to keep his hold on the land of Canaan, and when it was made the habitation of the children of Israel, and the law of God was made the law of the land, he hated Israel with a cruel and malignant hatred and plotted their destruction. [p. 689] Through the agency of evil spirits strange gods were introduced; and because of transgression, the chosen people were finally scattered from the Land of Promise. This history Satan is striving to repeat in our day. God is leading His people out from the abominations of the world, that they may keep His law; and because of this, the rage of "the accuser of our brethren" knows no bounds. "The devil is come down unto you, having great wrath, because he knoweth that he hath but a short time." Revelation 12:10, 12. The antitypical land of promise is just before us, and Satan is determined to destroy the people of God and cut them off from their inheritance. The admonition, "Watch ye and pray, lest ye enter into temptation" (Mark 14:38), was never more needed than now. Click here to read the next chapter: "David at Ziklag"